Welcome to Fall Fun Friday! This six week series will be hosted by my friends Jay, Sandra and myself. I will post links to their blogs down below. 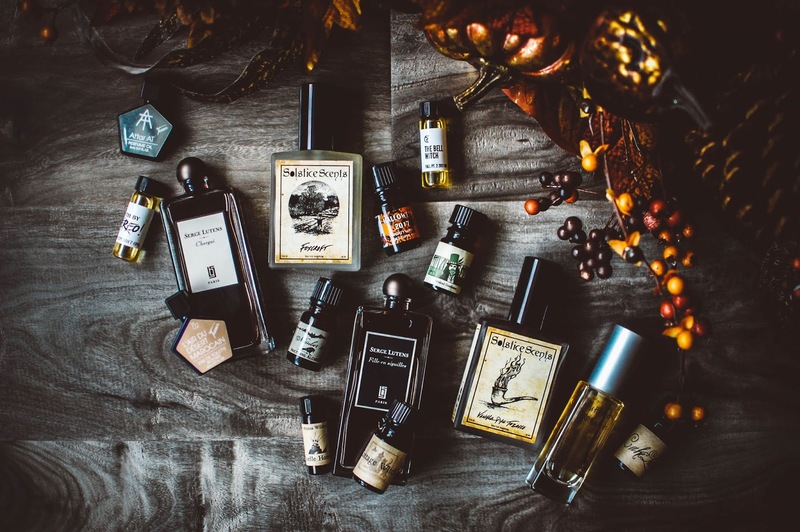 This first post in the series will feature some of my current favorite fall fragrances. Lately I have been craving tobacco and leaves, resins and spice. Some of these are old loves and some are newer. Serge Lutens Chergui is a stunning aroma full of deep woodsy fruits and tobacco. Serge Lutens Fille en Aiguilles slinks about with juicy pine that is warm and flush. Solstice Scents Foxcroft tumbles about the skin like leaves blown in an autumnal breeze. Solstice Scents Vanilla Pipe Tobacco feels right anytime to be honest but adds an extra layer of cozy during the fall. Tauer L'air du Desert Marocain and Tauer Attar are perfect once the air becomes more crisp. Again, truly they are perfect anytime but I tend to enjoy the comforting spice of Desert and the smoky warmth of Attar once it gets cooler. Wylde Ivy Autumn Twilight's sweet spiced cider musk is sugary and sparkling, light hearted and easy. Sixteen92 Death By Stereo wears like a leaf strewn nag champa and The Bell Witch is a wonderful blend of earthy apples and pumpkins. Arcana Wildcraft Cake Lust and Undead Gentleman scratch that sweet gourmand tobacco itch that I get sometimes. Arcana Wildcraft's Quelle Horreur brings to life a spooky French Quarter evening with dark gardenias and haunting musk. Again, more tobacco. Mmmm. Arcana Wildcraft Cottage Witch also rings my chimes this time of year. Spiced ginger cookies and a bounty of fall harvest treats delight the senses. Nocturne Alchemy Halloween 2017 delights with rich vanilla and a side of cardamom and sandalwood. Nocturne Alchemy Pumpkin #15 is full of copal and oudh and those resins make the pumpkin pie so smooth and deep. This one has sold out already but a quick restock is taking place later this morning. It is one not to be missed. My fall candle collection houses a typical classic or two and some newbies from the Wick and Fable line. Bath & Body Works Leave because I am perfectly fine being basic. Timberwick Ember Glow warms with its softly spiced woods and crackling wick. Wick & Fable candles in Mordor, Gryffindor, The Burrow and Hog's Head Inn will all be reviewed as I burn them but they have components of spice, woods, fireplaces or some other snug note that makes me think of fall. (You know, since I am from Florida and I have to borrow the typical temperate fall that we lack). Ten Digit Creations Practical Magic is a lovely earthy incense that reminds me I need to read the book. Also the Haunted Soul/Pipe Tobacco/Vintage Vanilla skull is going to be pretty spectacular. 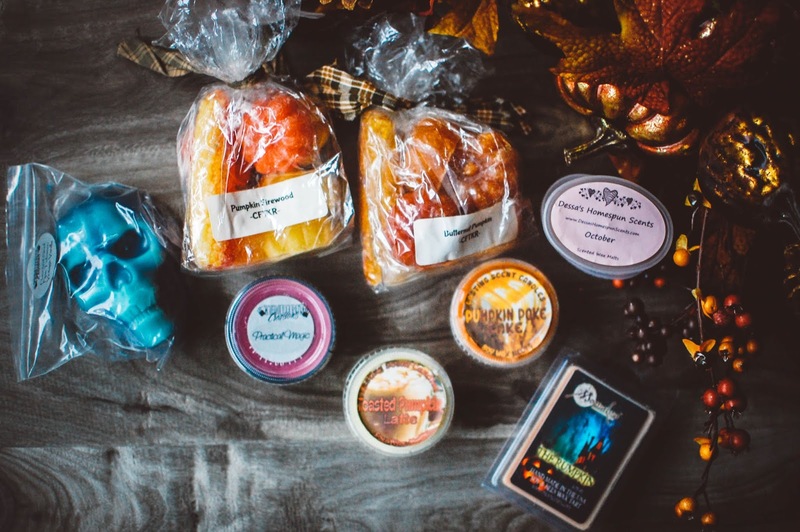 Dessa's Homespun Scents October blends all my favorite fall notes. Candles From The Keeping Room Butternut Pumpkin and Pumpkin Firewood both won me over as some of my favorite pumpkins. 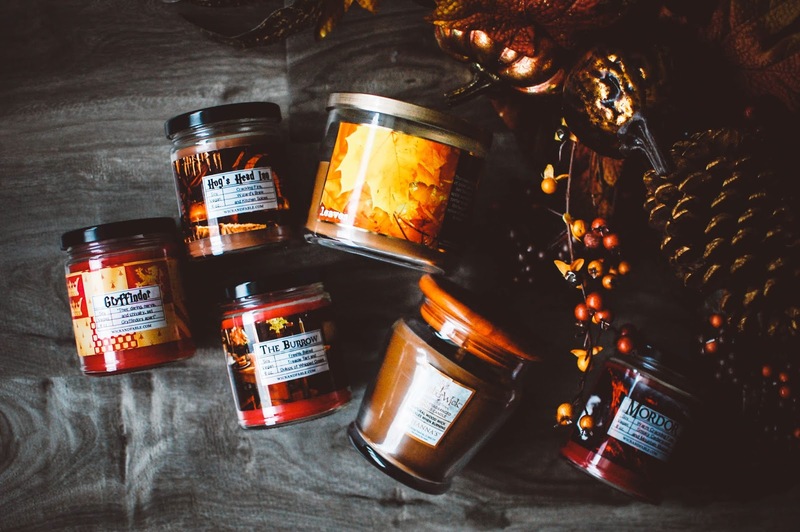 Butternut Pumpkin is rich and spicy and a touch rustic while Pumpkin Firewood is simple the best pumpkin bonfire/fireside/campfire scent I have smelled yet. Lasting Scent Candles Toasted Pumpkin Latte is one of the few coffee scents I enjoy. Creamy, sweet and delicious. Pam's Pumpkin Poke Cake is yummy too. MooScents The Rumpkin is bittersweet. SO much lavender pumpkin beauty but this is the very last one I have and there is no more to be had. Especially since Moona herself announced her stepping back to only do perfume while Paul (the guy who ran MooScents) now takes over everything else for MoonaLisa. So I doubt he will be doing MooScents anytime soon. Or ever. We hope you join us for this series and please chime in with your current fall favorites in fragrances. So I must comment and get this out of the way... THAT BLUE SKULL IS AMAZING!! I'm not normally one for skulls but that is pretty sweet. Now that is out of the way, hello there! I can't wait to read more on yall's fun fall series. I know it will be a treat. So many good scents in your fall lineup of goodies this year. I just adore the little corn shapes from CFTKR. Too cute to boot. Have a happy weekend Julie. Too sad about Mooscents, Rumpkin sounded like such a great scent along with many others that I pondered on getting on her site. It really is amazing!!! It looks awesome and smells even better! I am determined to cut it up and melt it this year simply because I know it will be hard to. Carol's Indian corn really is beautiful. Those are also hard to melt. I end up melting all the pumpkins and saving the corn for last. LOL! Literary candles are always the best. <3 I hope you can at least sample the Vanilla Pipe Tobacco someday. I cannot imagine being in a no perfume working environment. It would be VERY hard for me. 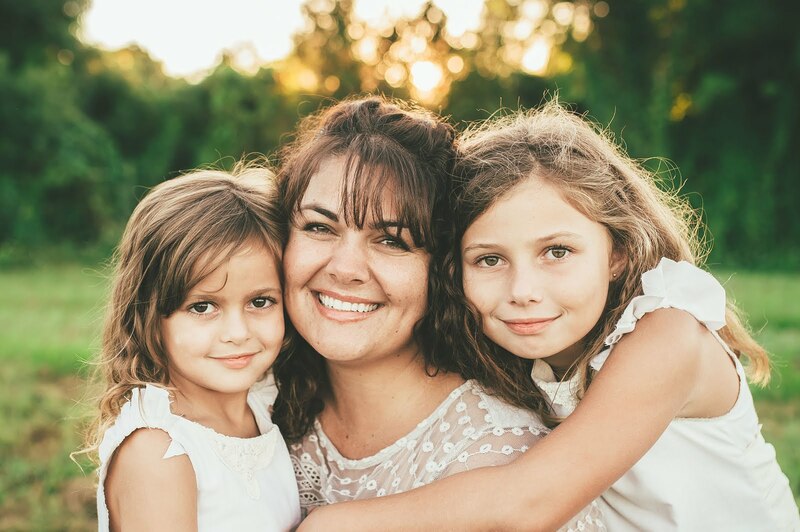 Plus when the kiddos get back from PE and their sweat glands are pumping overtime in their pre-pubescent bodies, I am always happy I have some perfume on hand. I will have to send you a little decant of the Halloween 2017. No worries! Life is crazy. I am struggling to make my rounds as often as I would like. I actually read yours and Deb's and Jay's posts via the email feed but then I want to actually comment too. YES! Mary Kay always had those seasonal make up looks with the warm tones, cool tones and such. Anytime I used the whole card on my face I ended up looking like an 80's trollop. All I was missing was the big hair and an active role on Dynasty. My skin tone is so strange. Like a pinky tan with some olive underneath. I never quite know what is most flattering so I just wear it all. I do know the super cool tones do not look well on me. Rather deathly indeed.